If you’re looking to define a space, or enjoy an evening barbecue with family and friends, a pergola may be just what you need! 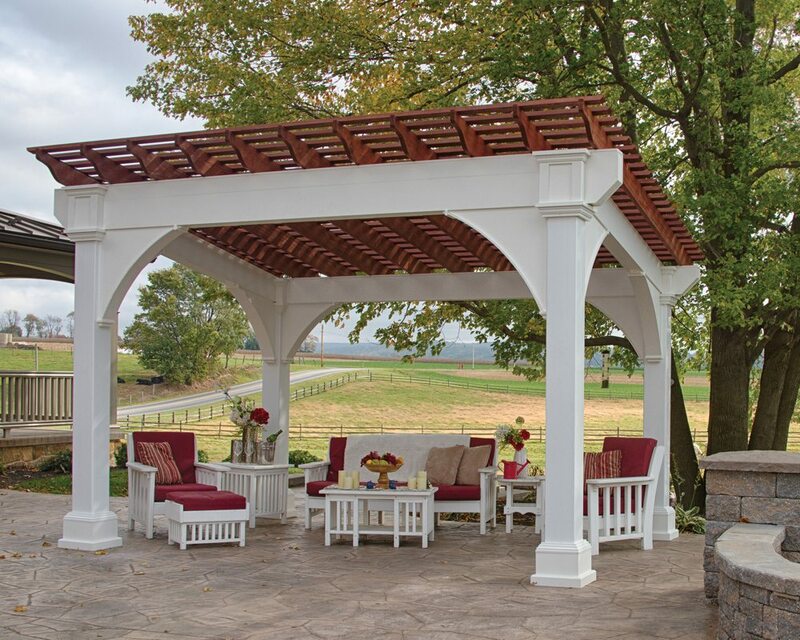 Use our simple pavilion builder to design and personalize a vinyl pergola with your choice of colors and additional add ons. Upon receiving your request, a sales associate will contact you with a quote. An outdoor vinyl pergola can be used to train your roses or vines and create a touch of architectural interest. Create an outdoor entertainment area with your choice of our outdoor patio furniture. Whether it’s an intimate dinner for two or an upscale barbecue with your friends, your backyard pergola will take on an air of romance your guests won’t forget! We also offer a selection of elegant wooden pergolas. These attractive vinyl pergolas are made from solid southern yellow pine and wrapped in high quality vinyl, making your pergola virtually maintenance free. Add just the right touch of elegance to your garden or backyard with a quality-built patio pergola. Green Acres Outdoor Living offers a selection of vinyl pergolas at our convenient locations in Allentown and Easton PA. From our extraordinary sales associates to our friendly, talented installation professionals, you can count on Green Acres to give you the exceptional service you deserve!